A polar bear plunge of sorts has been going on for 8Ys in Anchorage, AK. 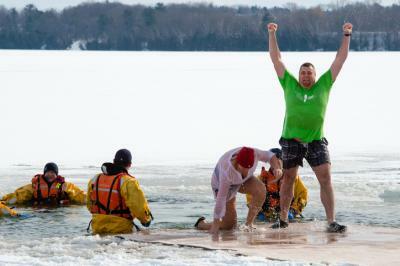 More than 1,000 people jumped, stepped or were pulled into the freezing cold water of an ice-covered lake to benefit Special Olympics in December. Some consider it a rite of passage; others say they think the jump is "lots of fun;" and still others think it is nuts. Around 5,000 native Alaskans and transplants alike have taken the plunge since the first of the year and raised over $2mm for the Special Olympics. This reminds us of the plunge many doctors must make into the icy waters of private practice and how community bankers can help soften the blow. In the wake of uncertainty about the future of the US healthcare system and continuously changing regulations regarding health insurance, doctors are finding it increasingly difficult to make their practices profitable. As a result, many independent physicians are changing the way their practices operate. Community banks should take note as they consider this important part of their customer base. Despite an overall growth trend and the associated increased revenues among medical practices, many doctors find it difficult to set up a practice on their own these days. According to a TD Bank survey, doctors just starting out are more likely to buy into or purchase an existing practice than they are to just hang their own shingle and start a practice from scratch. Here, TD Bank found that 39% of doctors in recent years purchased existing practices, while 37% started from scratch. Looking ahead, 50% of doctors surveyed indicated they would consider acquiring, buying into, merging or selling their own practice because of the high expense of running a medical practice these days. Bankers should note that of the doctors considering mergers, sales or acquisitions, 73% expect to make these changes within the next 4Ys. While an aging baby boomer generation and the associated increased business for the medical profession would seemingly make doctors more profitable than ever, the realities of running a medical practice are causing some to look for additional financial support. Among the factors physicians cite as the biggest impediments to running profitable practices are slow reimbursements from insurers, high overhead costs for regular expenses such as rent and supplies and the need to continuously upgrade technology. Fortunately for community banks, which are already among the most active lenders to independent doctors and medical practices, all of these factors are more than likely to result in an environment of increased borrowing. Talking to your physician clients about their businesses will help identify new loan business opportunities this year. Of note, besides the usual loans for new practices or business expansion, areas that independent physicians say they expect to invest in the near future include the purchase or lease of new technology, the addition of more staff and training, and education efforts. Another way that community banks can boost the business they do with physicians and medical practices are by working with them on payment service options for patients. This part of the business has become increasingly important, as the number of payments coming directly from patients has risen significantly. An overall increase in general healthcare cost has led insurers to pass a higher portion on to patients. According to a JPMorgan study, these changes have resulted in a 200% increase in payments by patients and a more than 300% increase in the number of automated payments made between 2011 and 2014. Between increased loans for mergers and/or expansion, loans for the growing cost of a medical practice and the increasing importance of a solid payment system with insurers and patients, community banks have many ways to support their physician clients. Continue to take the plunge with these practices as they will still be growing and with your help, the growth does not have to be a frigid experience. Yields soared 8bp as slightly weaker unemployment was offset by higher wages that point to inflation pressure. Classified loans are those rated Substandard, Doubtful or Loss. Criticized loans include all classified loans and also those rated Special Mention. Deloitte research of audit committee disclosures in the proxy statements of S&P 100 companies finds three areas climbed by more than 10% in 2016: the number of financial experts on the audit committee, the audit committee's role in reviewing earnings or annual report press releases with management and the independent auditor, and the audit committee's role in approving audit engagement fees. Research by the University of Chicago's Center for Research in Security Prices finds the number of US listed companies has declined by more than 3,000 since its peak of 9,113 reached in 1997. This is despite the fact that the economy is much larger now. Heavy merger activity and private investment have gobbled up many companies that used to list themselves on US stock exchanges. PwC research finds the most important attributes surveyed directors say they would rank as very important are: financial expertise (93%); operational expertise (69%); industry expertise (68%); risk management expertise (63%); and international expertise (42%). Deloitte research finds most learners won't watch videos longer than 4 minutes in length.